Central Illinois Ballet, in residence at Illinois Central College, presents four performances of the holiday classic The Nutcracker December 15, 16 and 17 in the Illinois Central College Performing Arts Center, located on the East Peoria Campus. This is the fourth consecutive year Central Illinois Ballet has presented this holiday classic. This year’s production boasts a cast of nearly 100 members ranging in age from 3 years old to adult. CIB has its first international dancer this season with Jiwon Ha of South Korea dancing the part of the Sugar Plum Fairy. Additionally, guest artists Adam Kittelberger and Ben Rabe from the Rochester City Ballet in New York will perform in the production. Both performed in past CIB performances. To accommodate growing demand, a fourth performance was added this year. Shows take place December 15 at 7 pm, December 16 at 2 pm and 7 pm, and December 17 at 2 pm. 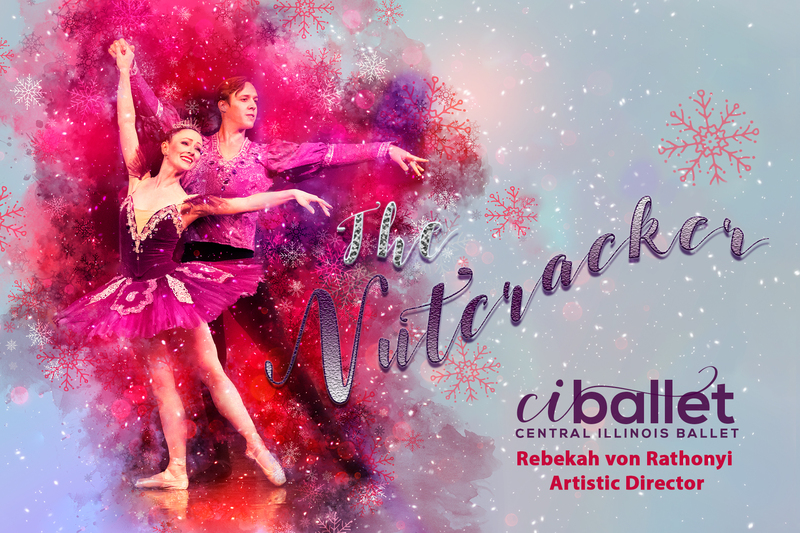 A marvelous production sure to put audiences in the holiday spirit, Central Illinois Ballet presents this season tradition under the leadership of Artistic Director Rebekah Von Rathonyi. Central Illinois Ballet was formed from its official training school, Cornerstone Academy of Performing Arts, and had always been the vision of Von Rathonyi. Also appearing in The Nutcracker will be members of CIB’s trainees, senior and junior company ensembles. These ensembles are comprised of current students at Cornerstone Academy pursuing a career in professional dance. For these students, CIB productions offer them the unique opportunity to dance alongside professional company members and learn first-hand what dancing in a professional company is like. “As an artistic director, we are always looking for ways to improve upon our work, whether it be in your choreography, staging, story or costumes,” Von Rathonyi said. “That’s how we grow as human beings, that’s how our dancers improve and how our productions stay fresh. Central Illinois Ballet offers an evening that will dazzle the whole family and leave Sugar Plums dancing in your heads. With original choreography by Rebekah Von Rathonyi, this ballet is a must-see production to get into the Christmas spirit. Seating for all shows is reserved/assigned seating and sold on a tiered pricing level basis. Premium level seating costs $35 for the general public and $15 for children under 12. Standard level seating costs $25 for the general public, $12 for children under 12 and $10 for ICC students. Central Illinois Ballet is supported as an in residence ensemble by the Arts at ICC, which has a rich history of enhancing the arts community and expanding education beyond the classroom. Arts at ICC presents more than 500 exhibits, performances, lectures, rehearsals, meetings, master classes, clinics, seminars, receptions, orientations, forums, auditions and tournaments annually. The Central Illinois Ballet is the result of three highly successful seasons of performances by the Cornerstone Academy performing ensemble. The Board of Directors, recognizing the demand for professional ballet performances in Central Illinois, formed the Central Illinois Ballet in January 2015. CIB consists of a resident company of 10 professional dancers and five Trainees as well as six regular guest artists. CIB also has a vast network of contacts of non-regular guest artists that have appeared with the company. CIB’s goals are to provide professional level ballets at affordable prices and raise awareness for ballet in Central Illinois. If you would like more information, please contact Miriam Kotacka, development director for Central Illinois Ballet, at (309) 620-3164 or email at [email protected].